Good afternoon, Church. Allow me to apologize for my absence from Parham on a day, and at this memorial service, when the entire community needs to embrace those who have suffered such a great loss. Several government officials and I traveled to New York City to meetings with investors and tourism promotion officials. I am truly sorry for my absence and for my inability to be with you at this time. Today is truly one of the saddest days of my life. In my every conscious moment, he stands beside me as he always did. So, we come today to mourn the passing and celebrate the life of Urcil “Sheik” Martin, my friend, my brother , my constituent and comrade. We all feel the deep sense of loss for a loved one who is cut down in his prime enjoying the fullness of life still filled with so much hope, so much dreams, so much love, and so much more to give; so much more to share. For Urcil, was still a man in his prime with today's health care forty-seven (47) years is still a young age, and none of us expec cted him to be cut down so suddenly without warning, without any time to say a proper goodbye. Bit we have lived long enough to know that life is not fair, and none of us are guaranteed this precious givt of life. We live e3very day by the mercy of God, and to Him we must give constant and incessant praise accepting his mercies and using every day to do good, to be kind, to love, to share, to live. Nevertheless, I take this opportunity to express my heartfelt condolences to the Martin family on the tragic loss suffered through the actions of another villager. Urcil Martin and I went to the Sunnyside School at the same time. He was my Head Boy and a very intelligent student who learned his lessons well. In those days only the well to do and affluent were able to attend the Sunnyside School, however Urcil was one of the few students who due to his intellectual ability was able to secure a scholarship from the Mill Reef Club. It was then that our close friendship was born which later developed into a lifelong bond of brotherhood. In fact, when I began to give consideration to becoming an elected politician, Urcil Martin was the one that brought me to Parham to be introduced to the most influential and grassroot members of the community. From then onwards he became one of my most trusted and loyal campaigners, and went on to become the Vice chairman of the St Peter's ABLP branch. On the three occasions that I sought public office Urcil Martin was the first person to put his name forward to have me nominated. I have loved him as a brother and a friend. I know it will be hard for most of us in these circumstances to forgive, but yet in the Book of Matthew, Chapter 18, Verse 21 and 22 tells us how we should respond: Then came Peter to Him and said Lord how oft shall my brother sin against me and I forgive Him? Till seven times? Jesus said unto him, I say not unto thee, Until seven times; but Until seventy times seven. As a Christian, the most difficult decision which God calls upon us to make, is the act of forgiveness. I join in all humble prayer to seek forgiveness of the sinner who has caused us this numbing pain, today. Here lies a very good man. He gave of himself to his community and, by extension, to his country. He sought no reward, he received very little thanks. Here lies before us a hard-working citizen whose honest labour helped to feed his fellow countrymen, while he took care of the needs of his family. In addition to being a devoted father and partner, Mr. Martin was also a farmer and he gave of his time freely and without limits to his community. As a young man he represented Parham in football. After his playing days were over he was involved in the Parham team playing the role of Coach as well as Counselor to the young players of the Parham Football Club. He was a strong community mobiliser and could be counted upon to assist members of the community in many ways. In an effort to offer more opportunities to the young men of Parham “Sheik” as he was affectionately called started the (A.B.A.Y.A) Able, Best at all Times, Aim High, Yes We Can, All for One Community Group. This further made him one of the most loved and respected Community minded individuals in the villages of Parham and Pares Village. All in all he was a great community minded person, loved by many and respected by most. Indeed, the Parham Community has lost a strong male figure in Mr. Urcil Martin. Mr. Martin did not seek monetary rewards for his unlimited help and assistance to his community. Many a young man in the village can attest to the fact that Mr. Martin through sports has helped them to keep their lives on track. He was a coach, friend and mentor to them. Had it not been for his intervention many of these young men could have been behind bars today. Mr. Martin did not seek the airways to broadcast what he was doing but the many young men lives that he had touched spoke silently of his goodness with appreciation and gratitude. “Shiek or “Iron Shiek” did not live a life of luxury, quite the contrary he was the sole breadwinner of the family. Indeed he worked to provide for his family; to this end when he was not farming he would be on a painting job. Here lies a perfectly innocent man who tried to resolve a problem with his neighbor by gentle persuasion and by lawful means. Instead of peace, he met a violent death. Injustice and pain and suffering are our lot today. Christ, our Saviour, suffered death upon the Cross for us and our sins. Let us therefore love one another. Let us abide the commandment of Jesus Christ. As your Parliamentary Representative, I can only mourn as you are now mourning. The Martin family has suffered a great loss that each of us can feel. I have lost a true brother and genuine friend. We have come to this place, a church, where we ask our God to usher our brother into the Heavenly Kingdom, there to live peaceably with the Angels. And so, we must take his death as a sign and symbol that we do not know the hour of our final parting. It may be sudden. It may be long. It may be now. It may be later. But whatever and whenever, we must know that those who would sum up our lives must confidently say, that we worked by the sweat of our brow and with the brow of our brain to change the world. That fore sure, and in sum, was true of Urcil “Sheik” Martin as it is true of all truly remarkable men and women. May we all lend our support to the Martin family, at this time, and to continue to give support long after today passes. And what is it to cease breathing, but to free the breath from its restless tides that it may rise and expand and seek God unencumbered? Dance on my brother “Shiek”! Dance on Urcil! Thank you, Mr. Master of Ceremony, CEO Colin James. Distinguished guests Ladies and Gentlemen... good afternoon. Thank you very much for taking time out of your busy schedules to join us for lunch today. Thank you Mr. Christopher Forbes for hosting us as the venerable Knickerbocker Club. As a new government, we inherited a country in dire straits, which remains fragile in terms of finances and economic fundamentals. The priority was to fix the economy, put people back to work and ensure an improvement in living standards. To achieve that, we had to attract new investments. Before coming to office, we had been networking globally. By the time we came to government, we were able to execute a memorandum of agreement with the YIDA International Investment Group to build a megaresort, spanning 10 years at a cost of $2 billion. Other investments followed, and in total we have had a $3 billion in investment pledges during our first 6 months. The change of government brought increased confidence in the population and investment community – almost spontaneously. The country's economy was teetering – on the verge of bankruptcy. 25% of the population was unemployed, and the country is used to full employment. In tandem, we had to stabilize the economy and save the country from collapse. So far, that's the single largest contribution we have made. It's not a situation we can fix overnight, but we have been able to grow revenues and address several outstanding issues. But with the visionary leadership of our Prime Minister, the change has begun. But before I introduce the Prime Minister, I'd like to thank our Special Economic Envoy, Mr. Robert De Niro - - - for joining us here this afternoon. Ours is a relationship which - - - because of Bob's outstanding record of achievements - - - brings countless advantages to our country. The truth is, speaking about a person that is a legend in his own time is a daunting task and Mr. Robert De Niro - - considered one of the greatest American actors of all time - - is truly a legend. “The hardest thing about being famous is that people are always nice to you. You're in a conversation and everybody's agreeing with what you're saying -- even if you say something totally crazy. You need people who can tell you what you don't want to hear”. May I suggest Sir, that it could be that nobody wants to disagree with a taxi driver named Travis Bickle or a godfather named Vito Corleone. And I therefore take this opportunity to thank the extraordinary Mrs. Grace Hightower De Niro for joining us this afternoon – and for sharing her husband with us. Mr. DeNiro's appointment is of critical importance to building our nation's economy and to further enhance and broaden the investment portfolio in Antigua and Barbuda - - - thank you Bob. We ambitiously have investment opportunities in Renewable Energy - - - to include Solar, Wind, and Geothermal. The new administration has pursued a multi-pronged approach to energy aimed at fulfilling its election mandate to modernize and transform the energy sector so as to provide more affordable energy to consumers to promote the adoption of Antigua and Barbuda's considerable renewable energy resources, while meeting the country's international obligations for global greenhouse gas reduction. The Ministry of Energy is committed to seeing Antigua and Barbuda become a leader in the application of renewable energy in the eastern Caribbean. This forms part of our thrust towards establishing Antigua and Barbuda as a regional economic powerhouse. A number of initiatives have been pursued in this regard. Among the first of these has been the enactment of the Renewable Energy Act, a landmark piece of legislation aimed at transforming the regulatory landscape for energy in Antigua and Barbuda and representing the first major change in energy legislation in Antigua and Barbuda since the early 1970s. A major initiative on renewable energy has been the government's partnering with two international energy companies, PV Energy and MEEECO, for the installation of 10MW of solar photovoltaic energy to be interconnected to the grid and to be placed at various government facilities and installations throughout Antigua and Barbuda. The first phase will involve 3MW of solar PV installed at the VC Bird International Airport. This will support the new airport terminal, which is expected to be a major electricity consumer. Barbuda is presently slated to receive 1MW of solar power. Additional target sites include hospitals and schools. Investment opportunities also exists, in the Financial sector - - - including Offshore Banking, Registration of Ships and Yachts, Private Air Line Registry, International Business Corporations and Internet Gaming. We have gone even further and created a Free Trade Economic Zone - - - to facilitate light manufacturing industries - - - and really - - - any other project that may be of interest to an investor. Economic Development, Investment & Energy let me assure you that we have adopted a number of new programs that have resulted in unmatched success in this, our first year of government. We are truly proud of the many new developments that are too many to speak of in detail this afternoon but suffice it to say that our aggressive policy of new property developments will add another 2,500 rooms to our room inventory in two years. We are also in the final stage of completion of a new Airport Terminal that will open in September, that will give us the capacity of accommodating up to 2 million passengers a year, with multiple VIP rooms, 3 first class departure lounges, genuine duty free shopping and 4 air bridges for ease and speed of boarding and disembarking flights - - - this will be the most modern airport in the Caribbean - - -and with that, we are welcoming increased airlift from all over the world. To this end, our government has delivered on a major promise to its cruise line partners by signing a $200 million agreement to modernize our St. John's port and harbor. A total transformation of the port facilities and downtown St. John's will include modern marina, world-class casinos, cafes and restaurants, hotels, condominiums, and high-end designer shops. The government is open to negotiations to facilitate these designs and development plans with our cruise line partners or potential partners, who are well respected in the industry with significant ties to the cruise sector. The Prime Minister is also aggressively promoting our twin island nation as the world's most attractive option for acquiring a second citizenship by foreign direct investment in our country. Our Citizenship by Investment Program. And with influentials such as yourselves here with us this afternoon - - - I would be remiss if I did not make mention that our Citizenship by Investment Program is not only internationally respected for its high integrity - - - we amended the legislation to be in compliance with the highest international security standards - - - and, at the same time maintained the program's competitiveness. These reforms are being widely commended - - - in fact, that our Citizenship by Investment Program is now often recognized as the best and most attractive of its kind globally. The Citizenship by Investment Unit has been developed to manage the process whereby individuals who make substantial investment in Antigua and Barbuda, can secure a path to obtaining Citizenship in the country once requirements have been met. The process of meeting these requirements will be carefully managed by a team of professionals who understand the importance of the program and the potential economic impact it has for Antigua and Barbuda. Investors not only benefit from Antigua's advantageous fiscal regime, but also get a 5 year passport that confers visa-free entry to over 130 nations worldwide, including Canada, Hong Kong, Singapore, the UK, and the European Union's Schengen Area. But to the matter at hand - - - introducing our Prime Minister. Ladies and gentlemen, this afternoon is a good one. Yes - - - it is a good afternoon because we are honored to be here with you. It is a good afternoon because we are celebrating the anniversary of our first year in office. It is a good afternoon because we are delighted to share with you that under Gaston Browne's leadership our first year in office has been a landmark for Antigua and Barbuda's economy - - - evident by extraordinary accomplishments in tourism, economic development investment and energy. So, as I introduce him, allow me to share with you a few words about the PM himself. When the Honourable Gaston Browne was born 48 years ago, Antigua and Barbuda was emerging from colonial rule and a mono-crop economy based on growing sugarcane. For more than 300 years, Antigua and Barbuda produced sugar and sea-island cotton for export to Great Britain. Antigua and Barbuda's foray into tourism was started by the father of the nation, V C Bird, who had the vision to provide lucrative concessions to the American aristocracy such as Mellons and Kennedys to establish vacation homes and the Mill Reef Club after the second World War. This vision by the our Father of the Nation resulted in new wealth for our country. New wealth enabled schools to be built. Our current Prime Minister Gaston Browne was a direct beneficiary of this vision - - - Despite the challenges he faced - - - he has always pursued academic excellence, making the very best use of his intellect. That is why Prime Minister is so keen on establishing the reality of the University of Antigua and Barbuda in the next 3 years. He has always been very gifted - - - very smart - - - he was very good at math, the basis of excellent cognitive thinking and intelligent decision-making. Nonetheless, Gaston's life as a teenager was extremely tough. Born and reared under humble beginnings, he had to face many challenging hardships. As a result, he is familiar with the struggles of the poor and vulnerable - - - but he will tell you that he believes there were some benefits for him starting off in humble beginnings. It has motivated him to prepare himself - - - physically and academically - - - to acquire the skills that would be of service not only for his own survival and advantage - - - but more importantly - - - to uplift and empower all the people of Antigua and Barbuda. His is a true success story - - - one whose intelligence and resilience has propelled and equipped him to lead. A student at the City Banking College in the United Kingdom - - - he gained a first degree in banking and later pursued studies at the University of Manchester - - - earning an MBA in Finance. A banker by vocation, he managed a banking group comprising a domestic bank, an offshore bank and a trust company - - - and owns and operate a number of successful private businesses - - - while also serving on the board of several private and publicly owned corporations. A strident and unrelenting fighter for the rights of the people - - - despite his persuasive activism and successes - - - he remains humble and accessible to all - - - serving continuously as a legislator for the past 15 years - - - five of which he served as our country's Minister of Planning and Trade. He is well-grounded in the realities and the priorities of his country, as was demonstrated on the morning following his swearing-in as Prime Minister - - - June 13, 2014 - - - when he signed a Memorandum of Understanding with the huge Chinese conglomerate I spoke of earlier, the YIDA Investment Group. That act defined his strategy as Prime Minister. He has set out to attract foreign direct investment to Antigua and Barbuda, in large quantities. He knows that the solution to joblessness and unemployment in Antigua and Barbuda lay in imported capital. The notion that you sit and wait for investors to come to the country is not realistic. All the islands in the Caribbean are beautiful, and the only way we can differentiate ourselves is through the service we provide. We are far more embracing of foreign investors than any other country in the Caribbean. We have a legal system based on British jurisprudence and investor-protection agreements with nations including Germany and the UK and our concessions rank among the best in the world. Antigua and Barbuda understands we cannot grow and develop rapidly without foreign direct investment. They are investing because they are assured that everything will be done to ensure an extremely favorable tax environment with a package of attractive concessions and incentives for potential investors. You can be assured of a helpful government and a proactive Prime Minister who will do all that is necessary to bring success. Antigua and Barbuda is very fortunate to have this youthful, energetic, highly intelligent, deeply-caring man as its Prime Minister. Ladies and Gentlemen - - - it is both an honor and a privilege for me to introduce the Prime Minister of Antigua and Barbuda. Ladies and gentlemen - - - I give to you, Prime Minister, the Honorable Gaston Browne whose vision it is to transform Antigua and Barbuda into the economic powerhouse of the Eastern Caribbean akin to the Singapore model. Tourism Stakeholders Meet to Discuss Improvements in Ground Transportation and Transfers. 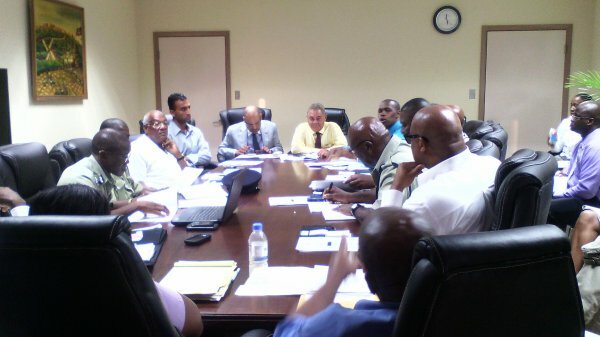 May 20, 2015...St. John's, Antigua...After two days of meetings and discussions between multi-stakeholder groups to include Taxi Associations, Tour Operators Hoteliers, Transport Board, Antigua and Barbuda Airports Authority, Royal Police Force and Ministry of Tourism Officials: there is a meeting of the minds to improve the “ Visitor Experience” in ground transportation. The Ministers of Public Utilities Aviation and Transportation Honourable Robin Yearwood and Tourism Economic Development Investment and Energy Honourable Asot Michael also participated in the discussions. Minister of Tourism Honourable Asot Michael made it clear that “Tourism is and will remain the key economic driver for Antigua and Barbuda and the “visitor experience is paramount. Working collectively can only bring all those involved to achieve the one common goal of providing the best tourism product across the region”. Issues discussed were Established Routes, Standards, Legislation and Training to improve the sector. Minister of Public Utilities Aviation and Transportation Honourable Robin Yearwood applauded the contribution made by Taxi Association Executives in ensuring that the sector is regulated to manage illegal operators, and their members pay more attention to safety and security. Tourism Consultant Shirlene Nibbs reminded the stakeholders of the Strategic Direction of the destination and the need for all service providers to deliver a “quality visitor experience” that is aligned to the middle to luxury guest we are actively attracting. . “If we want the industry to grow make the economic contribution to its true potential everyone has to play their part,” Nibbs reiterated. Coming out of the meeting as well is the commitment of stakeholders to review the draft legislation presented by Mr. St. Claire Soleyn that addresses having classification and licensing of selected tourism enterprises. Also in attendance was Mr. Don Smith VP of Guest Transportation and Airport Operations who made invaluable contributions to the discussions. 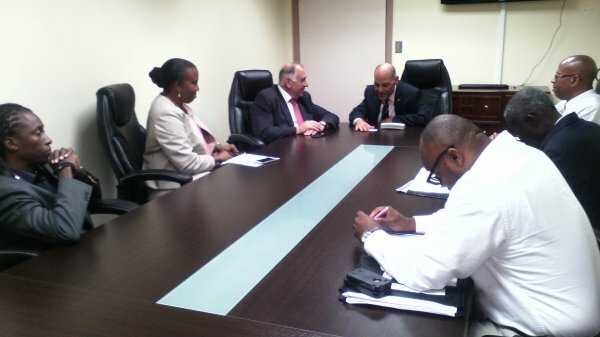 May 22, 2015...St. John's, Antigua....His Excellency Bahij Mansour, Ambassador to Israel paid a courtesy call on the Ministry of Tourism, Economic Development, Investment and Energy on Wednesday. The Ambassador said, “I am overjoyed to be here with you and I hope that the relationship between Antigua and Barbuda and the State of Israel can deepen cooperation, especially in Tourism, Agriculture, and Energy. I am here to reinforce this relationship and I hope that in the coming years, the relationship will grow stronger. Ambassador Mansour met with Tourism Minister Honorable Asot Michael, Tourism Consultant Shirlene Nibbs, and Advisor on Energy Brian Challenger, Solicitor General Lebrecht Hessey and Project Manager St. Clair Soleyn. Minister Michael said “with the Ministry's thrust to increased Tourism arrivals and having a more diverse source market, he is looking forward to Israelis visitors making Antigua and Barbuda a destination of choice. With this as a major focus the waiver of visas for visitors from Israel will be looked into. 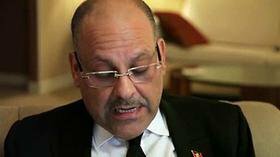 Ambassador Mansour stated, "Once agreements are put in place more tourists will be able to visit Antigua". Another area Minister Michael spoke on was that of renewable energy and he looked forward to Technical support from Israel that has a lot of expertise in the area. In the area of Tourism Education and Development the Ambassador indicated that Israel provided quite a few scholarships for Caribbean Nationals. The exploration of offering courses in Kosher Cuisine was discussed. The Ambassador indicated with the inclusion of Jewish cuisine or offerings on the menu in hotels, this will indeed be another plus to lure visitors from Israel to Antigua and Barbuda. The Ambassador is also responsible for Grenada, Dominica, Haiti, Jamaica, and the Dominican Republic. Government is giving an enthusiastic welcome to the sod-turning exercises that marked the start of work on the US $2 billion dollars in- vestment project by the YIDA International Group.In monumental ceremonies, both on mainland Antigua and on Guiana Island, representatives of YIDA International Investment Group, senior government officials, and distinguished persons participated in the exercises. In monumental ceremonies, both on mainland Antigua and on Guiana Island, representatives of YIDA International Investment Group, senior government officials, and distinguished persons participated in the exercises. The primary site for the ceremony was at Barnacle Point. There the government and the YIDA Group officials ad- dressed the audience. The project will be the first of its kind in Antigua, involving high-end tourism facilities. There will be the establishment of the Antigua Special Economic Zone. Governor General, His Excellency Sir Rodney Williams welcomed the major transformational investment into the country by the YIDA Group, seeing the income and inputs as significant boosts for the country's economy. Prime Minister. Hon Gaston Browne, aptly described the investment to be transfor- mational, stating that it will help to realise the Govern- ment's dream of making Antigua and Barbuda become an economic powerhouse. But it was the voices raised in opposition to the project over their environmental concerns, that the Prime Minister gave rational and pragmatic explanation. PM Browne said he will not allow minority groups or fundamentalists to dictate for the majority of the people. He explained that he is all for listening to the concerns of groups in the society, but in the end, the decision rests with his government. The Prime Minister called on those opposing the project based on 'misguided' or even real environmental concerns, to be balanced in their approach. He said that both the government and the developers will seek to implement the project sensibly and responsibly.